Going to the movies is one of my favorite ways to curb homesickness. Movie theaters are great places to escape to when the trials and tribulations of living/traveling in another country are just becoming too much and all you want is something familiar. The basic setup is always the same and most theaters around the world will play movies in English (with their native language in subtitles, of course). I've gone to the movies in Europe, in the US, and now in Korea and by far the best experience I've had was in Korea. The ultimate movie experience begins with you being able to pick your seats while you purchase your tickets. Nothing puts a damper on your movie experience like having to sit through 20 minutes of commercials before the movie, just to get a decent seat. In Korea, you have the option to bust in with two minutes until the movie starts and still obtain optimal seating. Eff yeah! You know how whenever you go to the theater, you wish that no one will sit in front of you so you can put your feet up on the chair in front of you? Well, on our most recent trip to our local theater (a Megabox), we excitedly discovered that every seat came with a footrest. Yes, a footrest!! How awesome is that??! The armrests on the seats are all extra wide so every person has two arm rests and no one has to share or fight over it. The seats leaned back just enough to make it super comfortable but not so inclined that you'd be tempted to fall asleep. Seriously, what more could you ask for? There are also "couple" seats available for lovers or BFFs. 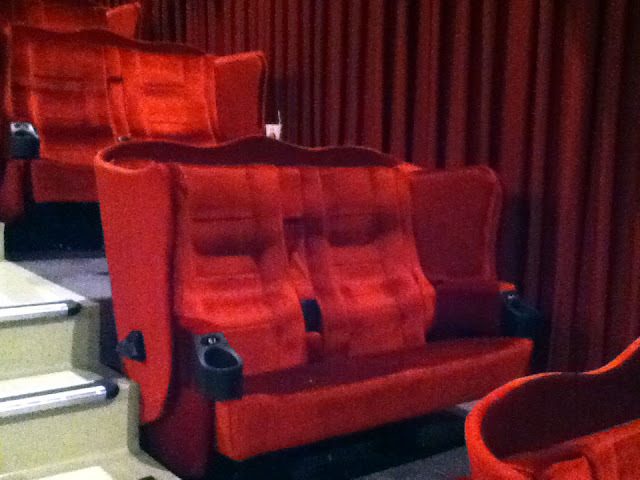 They are loveseat-sized seating on the sides of the main seating area upholstered in red velvet (oh, la la). With the loveseat, you both get your own footrest and the armrest in the middle folds up for snuggle time. How cute is that?? 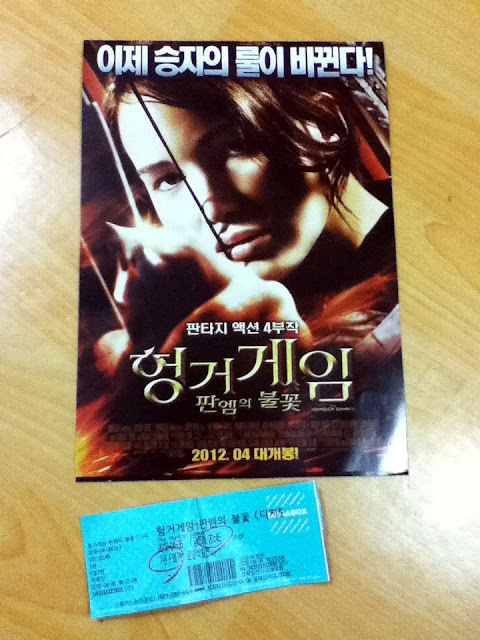 Another great part about movie theaters in Korea is that they all have free mini movie posters. They are all in Korean, but that really just adds to the charm. We always snag a few to hang in our apartment. 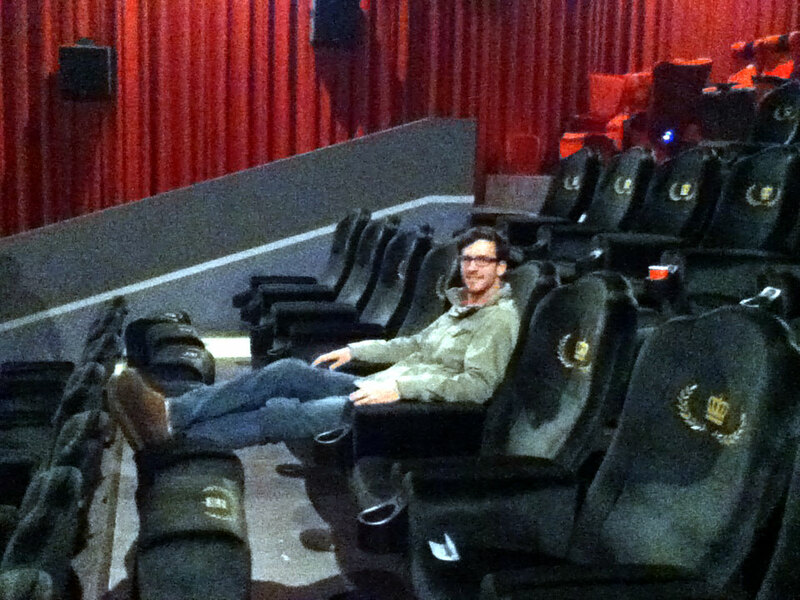 I just went to a movie theater in Macau that has spoiled me rotten for the rest of my life! Why can't the theaters in the States by like the ones in Asia??? They really should step it up in the States! I'm sure they'd get a good return on their investment. We went to two movies this weekend! Ides of March (because Hunger Games wasn't playing) and then Hunger Games! Great movies! And we got to eat churros! I love double features! :) Did your theater have foot rests, too?? No, I was hoping it did. I've been to three different theaters, two this past weekend, and none had footrests or personal armrests!! It was a bummer after seeing what you your theaters have! They have the cool seat reservation though, which I love. I wish they had that back home. Field Trip to Gurye - "The Road to Nature"